Pavillon Monceau offers accommodation in Paris, 1.7 km from the Champs Elysées and the Arc de Triomphe. Pavillon Monceau provides courtesy and charm in the heart of the city. Free WiFi access is available throughout the property. This bright, classically designed hotel features tastefully decorated guestrooms and suites. The air-conditioned rooms include a satellite TV and a private bathroom with free toiletries and a bath or shower. A cold buffet breakfast is served 7 days a week in the breakfast room. Guests can enjoy a drink at the bar. There is a 24-hour front desk at the property. The Pavillon Monceau is centrally located near many of the city’s most alluring monuments. Pavillon Monceau is a 5-minute walk from Wagram Metro Station and Pont Cardinet Train Sation, providing easy access to the rest of Paris. Please note that extra beds are available in the superior room and upon request only. The Pavillon Monceau Piano bar is open every day from 17:00 to midnight. This air-conditioned room features free WiFi, a courtesy set with tea & coffee and a safety deposit box. Room service and breakfast in the room is possible with this room type. These spacious rooms offer breakfast service served to your room on request. This room features a private bathroom with free toiletries and a hairdryer. Some of these rooms have a balcony with a view over the Monceau district. 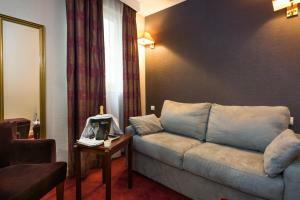 This Suite offer a living area with a sofa bed and a room with 2 beds. These suite is ideal for leisure trips of 3 adults or one family (2 parents & 2 children) or even for business trips, if you wish to have enough space to be able to work. This single room has a soundproofing, cable TV and minibar. It also has a private bathroom with free toiletries and a hairdryer. Rate: € 82.72 ... € 259.00; select dates below to get current rates.